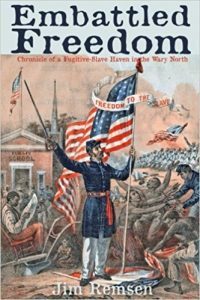 The Grand Army of the Republic Civil War Museum and Library will host a presentation with local author Jim Remsen on Saturday, June 17 at 12:00 PM on the bottom level of Scranton City Hall. If you had the chance to see Jim Remsen at Library Express last week or you were not able to attend, now is your chance to see him! He is the author of Embattled Freedom, a story that chronicles the lives of 13 black fathers and sons and the hardships they endured after serving in the Civil War, only to return home to a divided North. To access the museum, please use the entrance to Scranton City Hall facing Mulberry Street. For more information or questions regarding Jim Remsen’s visit, please call Hal Myers at 570-343-4145.